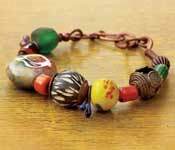 Now that you know how to enamel beads, let's make an enamelled bead bracelet. 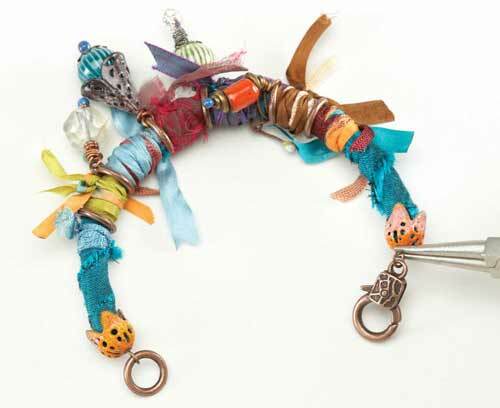 This bracelet is one of the many beautiful projects in Barbara's Book Torch Fired Enamel Jewelry. You can learn how to get your hands on Barbara's book at the end of this tutorial. "I can't decide if this is a bracelet or an anklet. It can only be an anklet if you're willing to break out into dance when you wear it! 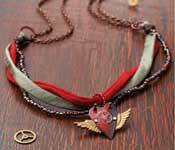 Whatever you decide, this piece is fun and easy to make. It's perfect for the hodgepodge of leftovers on your worktable — a "bench collection" of sorts. Don't dwell on planning your design; if you go with the flow, it will truly reﬂect you and your work." Without the enameling, let's say about 2 hours of uninterrupted crafting. Well worth the time to end up with this enamelled bead bracelet, wouldn't you say? 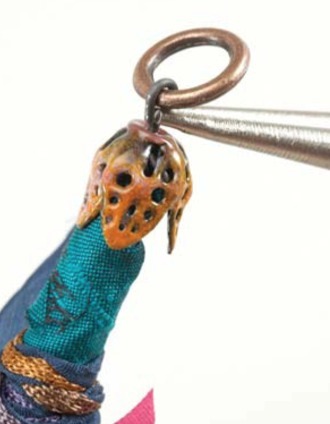 The enamelled bead bracelet base begins by establishing the straight of grain by using scissors to place a snip into the selvedge edge of woven fabric, about 1" (2.54cm) from the cut edge. Tear the fabric at the snip. To ensure that your enamelled bead bracelet bends nicely (and the fabric doesn't bunch up strangely) we need to cut the fabric on the bias. Establish the bias grain by placing the fabric on a ﬂat surface. 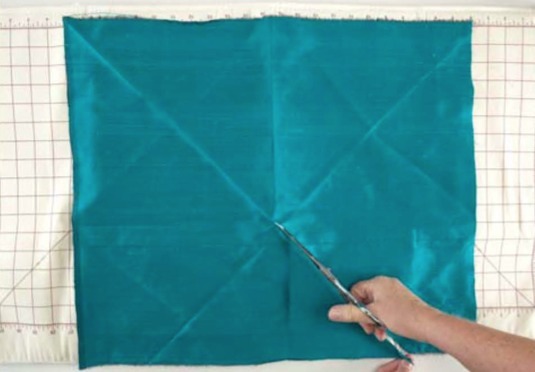 Pick up one corner of the fabric and bring the end diagonally across the fabric so that one torn edge of the fabric will rest on top of one selvedge edge of the fabric. Press the fold with an iron. 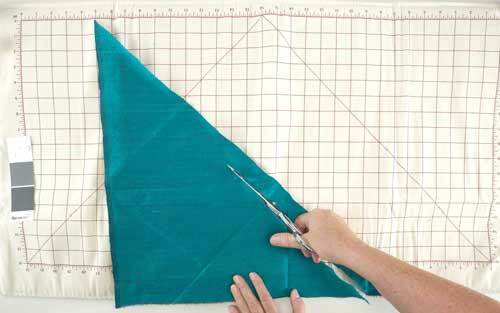 Measure and mark 1" (2,54cm) from the cut edge along the length of the fabric. Cut a 15" (38.1cm) bias strip. Spray adhesive on a 1/4" x 7" (6mm x 17.78 cm) piece of foam tubing. Starting at one end and working across, wrap the bias strip around the foam. Your enamelled bead bracelet needs some enamelled beads! Enamel four 12mm corrugated beads: one in White with Lime Yellow on top, one in White with Turquoise on top, one in Pumpkin and one in Clover (see Torch-Firing Bead Article). Enamel two 17mm ﬂower bead caps in Pumpkin and Clover. Thread a 4" (10.16cm) segment of 22-gauge sterling silver wire through a solid jump ring and make a wrapped loop. 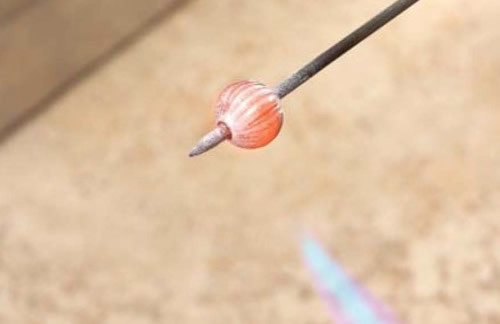 Thread a bead cap, an enamel bead and another bead cap onto the wire. 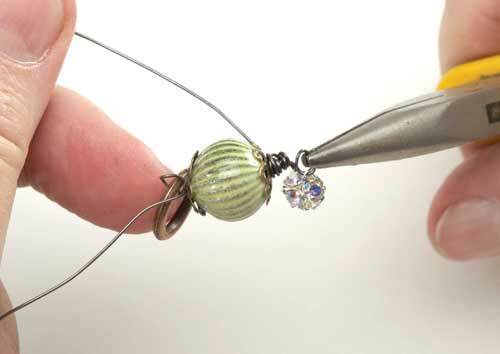 Make a wrapped loop ﬂush against the bead cap, but before ﬁnishing it, attach a small rhinestone dangle link. Wrap the loop with the excess wire. Create six dangles. You can choose to add different enamel and manufactured ﬁndings to the dangles as desired. Go wild! 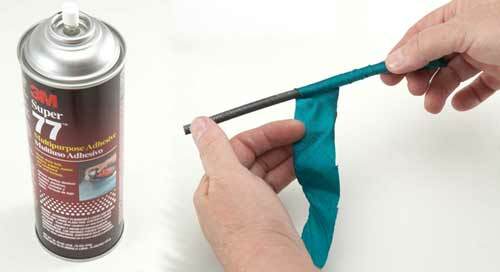 Wrap a bundle of ribbon and ﬁber strands around the tubing, starting 1" (2.54cm) from the end. 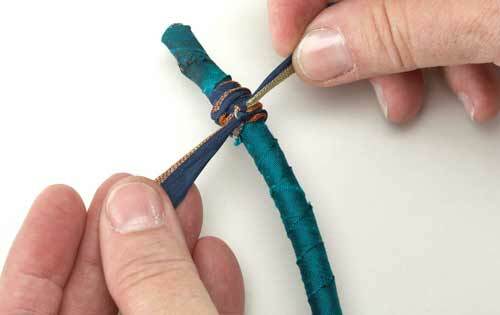 Tie the ends in overhand knots to secure. Slide a dangle onto the bracelet. 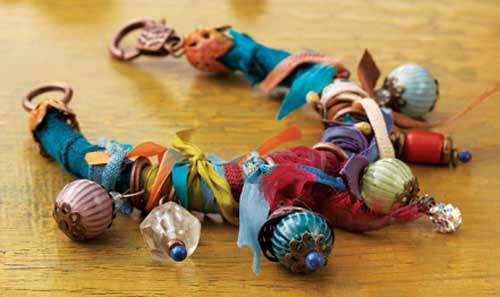 Wrap another ribbon and ﬁber bundle after the ﬁrst dangle to keep it from sliding on the bracelet. 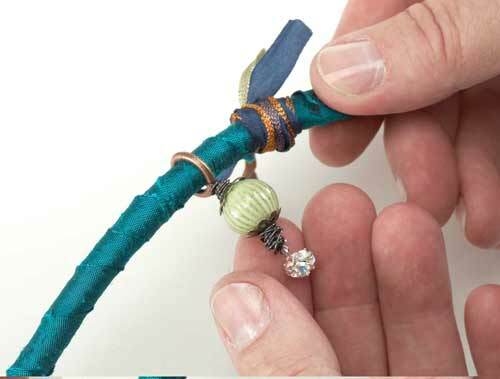 Continue sliding on dangles and wrapping bundles on the bracelet, stopping 1" (2.54cm) from the end and ending with a ribbon and ﬁber bundle. Repeat Steps 5 through 8 with remaining beads to make your enamelled bead bracelet look full and jaunty. Pierce the end of the foam bracelet with 3" (7.62cm) of 19-gauge annealed steel wire. Fold the ends up, keeping one end longer than the other. Wrap the shorter wire end around the longer wire end. 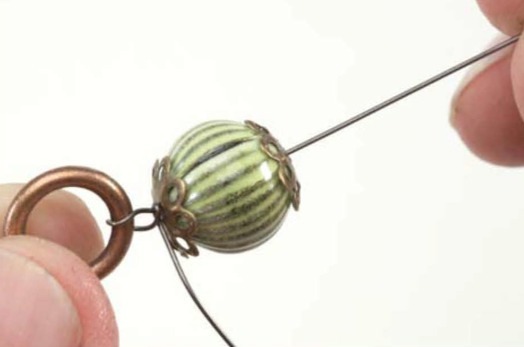 Thread an enamel bead cap onto the wire. 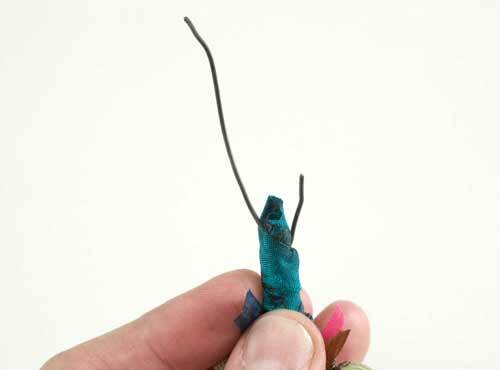 Trim the excess wire and make a simple loop ﬂush against the bead cap. Attach an 11mm solid jump ring to the loop. (See opening and closing jump rings). 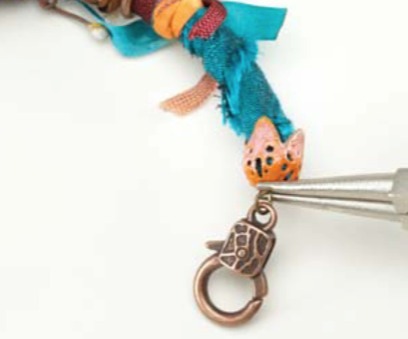 Repeat steps 9 and 10 on the other side of the bracelet, but attach a lobster clasp before closing the simple loop. Let's call this enamelled bead bracelet finished! 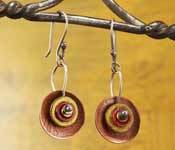 Barbara Lewis is the author of Torch-Fired Enamel Jewelry: A Workshop of Painting With Fire. If you enjoyed this project, you'll love the rest of the projects in her book. You can get a copy at ShopMixedMedia.com, Amazon.com, or at your local bookstore. 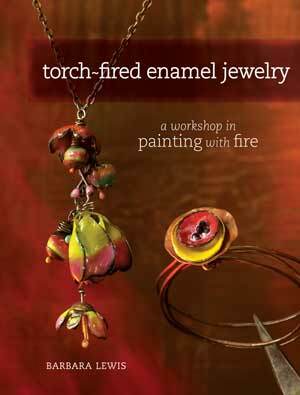 Get your copy of Torch-Fired Enamel Jewelry: A Workshop of Painting With Fire now.